The Daily Beast wrote a scathing critique of The Megalodon fiasco in 2014. Though it appears convincing, the “evidence” presented in these Shark Week documentaries is not real. It consists of interviews with witnesses and experts who are actually actors, as well as photoshopped imagery. Both documentaries are completely fake, continuing a recent disturbing trend in educational television. In short, Shark Week is lying to you, and it isn’t the first time. After 2013’s “documentary” aired, the Discovery Channel received strong criticism from scientists, media critics, and the business world. In response, Discovery issued a half-hearted and dishonest defense, with phrases like “there’s still debate” and “who really knows?” In reality, according to Megalodon researcher Meghan Balk at the University of New Mexico, “there is no doubt in the scientific community that Megalodon is extinct.” These sharks lived approximately from the middle Miocene (~16 million years ago) to the early Pliocene (~1.5 million years ago), Balk told The Daily Beast. There are a few ways that scientific experts know that megalodon is no longer alive. First and foremost, no one has ever seen one, and no evidence that they are still alive has ever been produced. Out of the countless megalodon tooth fossils that have been found around the world, none have been dated at less than 1.5 million years old. “Their fossil teeth are found until the Pliocene, with no fossil evidence beyond this time,” Catalina Pimiento, a megalodon researcher at the University of Florida, said. Some species of sharks can go through tens of thousands of teeth in their lifetime, which means that if these animals were still alive, someone would almost certainly have found a tooth younger than 1.5 million years old. Instead, the Discovery Channel chose to lie to their viewers, actively spreading fear and promoting misunderstanding about one of the most threatened groups of animals in the world. Again. Researchers have also found no evidence whatsoever of prey animals killed by sharks larger than a great white in the last 1.5 million years; and no, the recent viral news story about the 10-foot long great white whose tag was eaten is not evidence of a Megalodon. That shark was simply eaten by a larger great white shark. 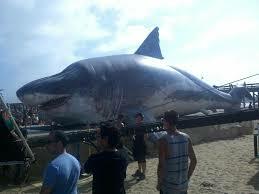 Megalodon was an impressive animal, and it’s no surprise that they capture the public’s imagination. A fact-based documentary about what scientists know about these fascinating animals could have been both educational and entertaining. Instead, the Discovery Channel chose to lie to their viewers, actively spreading fear and promoting misunderstanding about one of the most threatened groups of animals in the world. Again. New Discovery CEO Rich Ross stated the following when asked about Discovery channel’s faux documentary programing. “It’s not whether I’m a fan of it,” Ross said, which critics let slide. “I don’t think it’s right for Discovery Channel, and think it’s something that has run its course. They’ve done very well… but I don’t think it’s something that’s right for us.” The following link outlines Ross’s plans for the network without touching on specific programming.